Please introduce yourself and tell us what you do in the band! My name is John O’Callaghan and I am moral supporter and attempted empower-or of weirdness the individuals that are a part of EID. I’d like to think of this as more of a creative project than as a band. 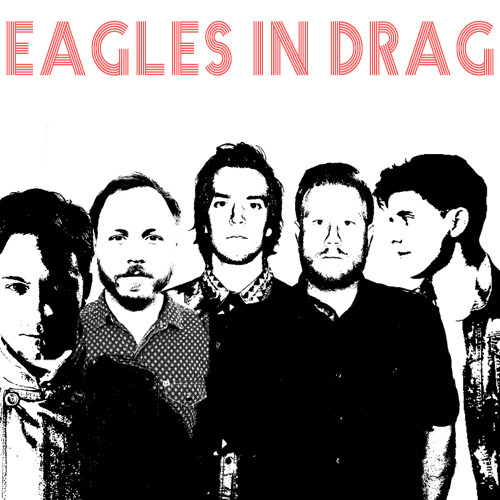 Eagles In Drag seemed like a project that appeared out of the blue, but you guys actually formed back in 2012. Why did you guys decide now was the right time to release your debut EP? I really wanted to wait for a time when 8123 had a clear plate and no other artists were really pushing any new material. It seemed like the right to release it and we did so without much (if any at all) marketing to reiterate the idea that this project was simply an outlet for expression and not something to get hung up on. How did the name Eagles In Drag come about? I remember hearing it while watching some Willem Dafoe movie. He called some front lawn flamingos by that name and I thought it was sort of clever. This project has a completely different sound than that of previous projects that you guys have worked on (This Century, The Maine, A Rocket To The Moon). When writing the EP, did you guys know what kind of sound you wanted to go for or was it just something you played around with to try and create something that was unexpected? I definitely brought a vibe to the table while writing and that laid the basis for the tunes. We all pulled from our subconscious inspiration and created what you hear now. The writing and recording all happened so fast that we didn’t have time to think too hard about what we were doing. In retrospect, if we had spent more time I’m sure things would have come out differently but that’s the beauty of making music. I’m personally a huge fan of the EP (which our site rated a 4.5/5), One Four Six being a favorite track of mine. Which song is your favorite and why? Thank you! Hard to really pick just one because it all came about so quickly, but I suppose if there were a gun to my head I’d say the first tune Pretty Girl Monster. That track feels like one that went from vision to reality in the most seamless fashion, not much changed from the writing to recording with that one. Can we expect a giant collaborative tour of This Century, The Maine, and Eagles in Drag sometime in the near future? For instance, Max Bemis recently went on tour under his own name, but also performed as Perma (a project with him and his wife), Eisley (his wife’s project), etc. It’s not in the cards. I’m sure if demand were to grow to a point we couldn’t ignore then something like that could happen, but for now we’re all still too involved with our respective groups. It would be a blast though. Thank you for your time! Is there anything else you’d like to add? Thank you for your time! It’s great to be alive. The Sun is shining where I am, and that is nice.